For a limited time you can listen to the track for free via the Soundcloud link below. If you are a voting member of NARAS, I respectfully invite you to consider Amanda Harberg’s Prayer for a Grammy classical “best performance” nomination. Sound engineer Drew Taurisano and intern Thomas Hagen setting up for the recording session at Carmel Presbyterian Church on June 1st. available on CD Baby, Amazon and iTunes. Alight features the premiere recordings of Amanda Harberg’s Prayer for flute and piano, and Daniel Dorff's Tweet! for solo piccolo. It finishes with my signature encore, Massenet’s Meditation from Thais for piccolo and piano. Prayer opens with the flutist rising gently out of simple arpeggios. The melody flows seamlessly from beginning to end, with one long rising and falling line, punctuated periodically by expressive responses in the piano. The work arcs twice, with imploring gestures in the high registers, and then gradually descends into a place of peace. In early 2010, I wrote a new piccolo piece for Lois Bliss Herbine to premiere at that summer's International Piccolo Symposium where she was a resident artist. The robins waking me up early every morning that May provided great inspiration, and one morning the opening theme and its contrasting theme poured out quickly. The form and development became a lot of fun to compose, with lots of elements of rondo, variations, and particularly using timbre contrasts as a way to make a full sonorous experience out of an unaccompanied piccolo work. 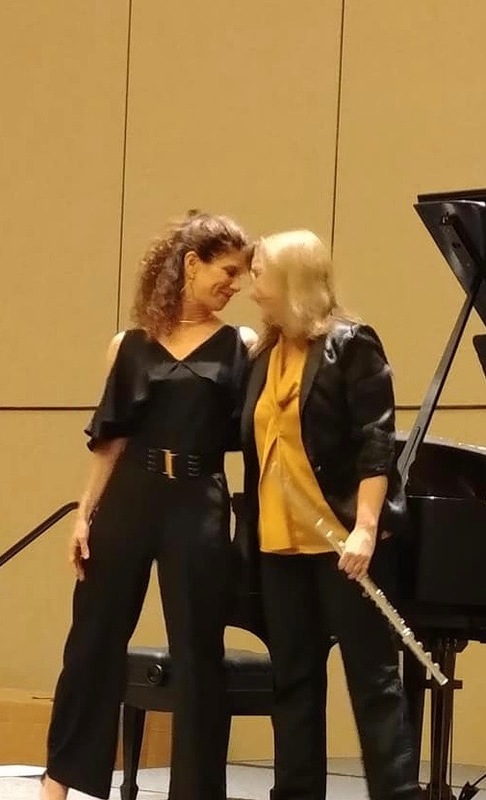 Kristyn Moore at Powell Flutes alighted on the idea for me to include premiere recordings and a single solo flute track in what was first conceived as an EP of three standard encore selections performed on the piccolo. In selecting the name for the project, I wanted to tie together Amanda’s Prayer, Daniel’s Tweet! and the encore that I have become known for over the years, performing Massenet’s Meditation from Thais on the piccolo. A greater challenge was my idea to tie the theme with past recording projects- my solo piccolo CD "Take Wing" (2004) which includes the premiere of Daniel Dorff’s Sonatine de Giverny, the chamber CD and title track recorded in my church “Illuminations” (2009), and my most recent New Age and World Music recordings for the United Nations peace initiative (2016 and 2017). I came up with White Dove, but after hearing the raw recordings, Kristyn alighted on our title. or to come upon accidentally. With only a few days before my booklet was due for print, the backstory unfolded with ease. As a student of John Krell (the pre-eminent piccoloist of the Philadelphia Orchestra from 1952-1981 and instructor at the Curtis Institute) I immediately thought of the teaching analogy of a bird alighting which was passed down to me. In music it means to turn-on-a-dime. There is a great moment in Daniel Dorff’s Tweet! central to this project where he lets go of a soaring and voluminous high D and the next entrance is low soft peck of a note marked “secretly tiptoeing”. It was the composer’s favorite moment at the NFA premiere in 2011. He said I sounded like an electric guitarist holding the reverb pedal while making the shift. This stalling technique was taught to me by John Krell (the author of Kincaidiana on the legacy of his teachers William Kincaid and Marcel Tabuteau). The trick (if one can call it that) is to fill up the space with sound on the proceeding forte with both volume and intensity (which is an extremely fast column of air which utilizes the overtone series and the interaction from produced resultant, difference and summation tones.) Pressurized air makes the sound more concentrated and travel a father distance than slow air. * A hall with great acoustics will accentuate the difference in an immediate drop off to slow or unpressurized air. Also needed is a great recording engineer who knows how to capture the relationship between the sound at close range coming from my instrument and the response of the hall, otherwise there will be no discernable difference to the listener in a recorded performance. Coming down to the wire to have our project ready in time for the NFA 2018 convention, Drew Taurisano alighted on a technique to present the flute differently then the usual classical mix. Rather than drawing out the tone of the flute I encouraged him to experiment, focusing attention to the spirit of the sound emanating from the acoustic response of the church. While I realize that this makes for an unusual presentation, I encouraged this aural anomaly because it spoke to my heart. I believe it more closely represents the experience the performer receives in the live performance. Special thanks goes to Jim Salamone and his Cambridge Sound Studios, Abby Palmisano, Minister of Music and the Carmel Presbyterian Church and to V.Q. Powell Flutes and Buffet Crampon for their generous contributions that made this recording possible.